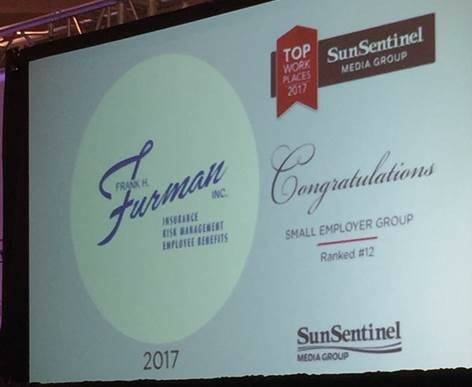 Frank H. Furman, Inc. - Top Workplace 2017Frank H. Furman, Inc.
Furman Insurance has been awarded a 2017 Top Workplaces honor by The Sun Sentinel. The Top Workplaces lists are based solely on the results of an employee feedback survey administered by WorkplaceDynamics, LLC, a leading research firm that specializes in organizational health and workplace improvement. Several aspects of workplace culture were measured, including Alignment, Execution, and Connection, just to name a few. 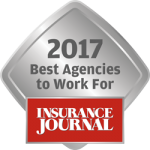 Furman Insurance are proud to be selected as a 2017 Top Workplace for the 2nd year in a row. The agency is #12 out of 40 small group companies. Dirk DeJong, CEO and Chairman of Furman Insurance, says, “We could not have done it without out incredible team here at Furman”.